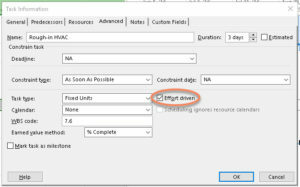 Even though Microsoft Project is fairly easy to use at the basic level–entering tasks and resources, assigning the one to the other, and fine-tuning a schedule–there are a few parts of the program that seem quirky, and can take a little practice to use comfortably. 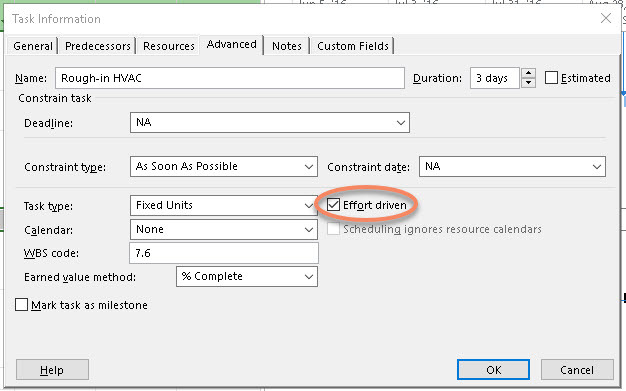 One of these is the checkmark in the Task Information dialog box called “Effort driven”. The name is fairly self-explanatory, in that a task’s duration (the thing we normally concern ourselves with) can be affected by how much effort we want to put into the task, in the form of resources. Specifically, how *many* resources. When the project manager first creates the task, it defaults to Fixed Units of work (stuffing envelopes for a wedding, or laying bricks for a wall would be good examples), and (if one chooses in the Program Options) Effort driven being on. The first time resources are assigned to the task, whether it’s one person, three, seven, or more, the duration won’t change. The program is assuming you know it takes, say, four days for six people to build a garden wall, and simply goes with the original duration. BUT…if, from then on, you change the number of resources (people, in this case), the program recalculates the number of days/weeks/etc. involved, as it assumes more people can do the task in less time, and vice versa. Not totally illogical. Nevertheless, there are some kinds of tasks for which the relationship doesn’t apply. If someone wants to interview a subject matter expert for three days prior to writing a manual, having one or two more people involved in the interview might help develop information, but probably won’t take substantially more time, or less. 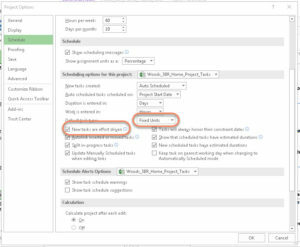 So the trick, when one wants to add or remove resources without affecting duration in Project, is to open the Task Information box, go to the Advanced tab at top, and uncheck Effort driven FIRST. Then, go to the Resources tab, add or remove people or other resources, and OK out of the box. After which, if necessary, one can repeat the process and turn it on again. On a more general level, depending on the task, the resources, and so on, one can remind oneself that it’s a good idea to go into the Task Information box->Advanced tab, and note the state of the checkbox before making changes. 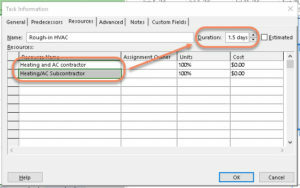 If the project will likely involve fairly frequent changes to resource assignment, leaving Effort driven off would probably cause fewer upsets to the schedule, though the manager would need to manually adjust it when needed. 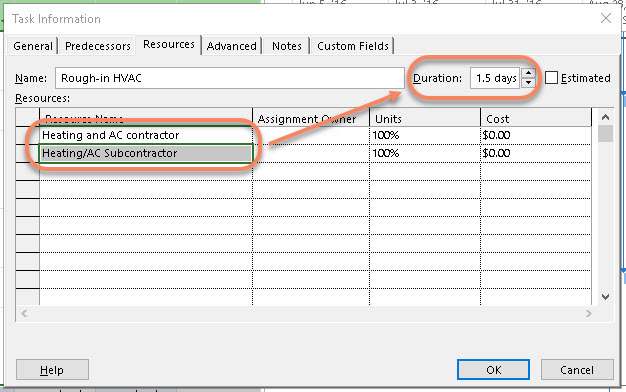 If the project resources are assigned and pretty much left in place, having Effort driven checked by default (again, this is an item in the Program Options which can be changed) would likely work in favor of the manager. 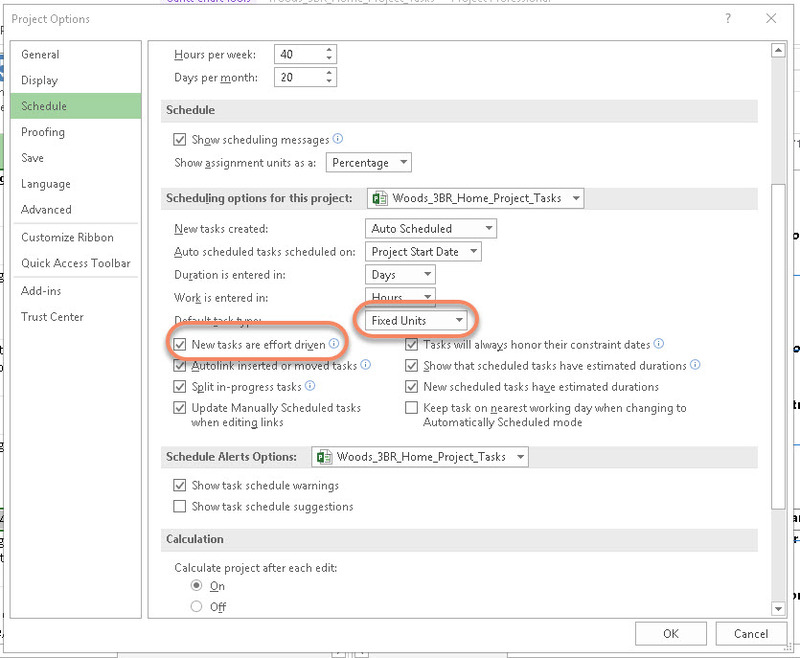 Keeping the checkbox state in mind, then, can help avoid trouble when shifting resource assignments around.